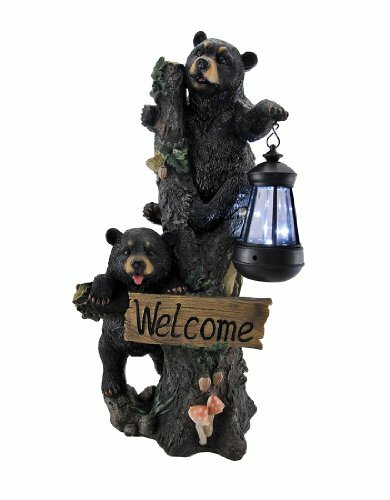 The Climbing Bear Rascals Garden Light Statue measures 18.5" tall, 9" long and 7" deep. 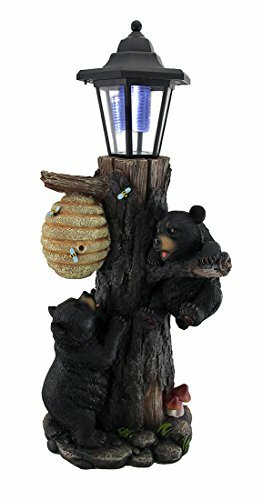 The Climbing Bear Rascals Garden Light Statue is made of composite resin hand painted and polished individually. Color Tone may vary from pictures. This LED lamp figurine is solar powered and the lantern has an On/Off Switch. Use him as a path light, tree decor, patio courtesy light, and many other areas of your house to your fancy!!! 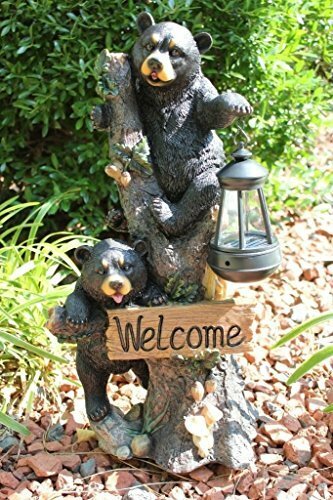 This wonderfully detailed outdoor garden bear cub statue will welcome guests to your garden or yard and help light the way on dark night with the solar powered LED light in the lantern the top cub is holding. The light turns on automatically in dark conditions, and lasts up to 10 hours under a full charge. Made of cold cast resin, the statue measures 18 3/4 inches tall, 8 3/4 inches wide and 5 3/4 inches deep. It`s hand-painted, and shows great detail. This statue makes a wonderful gift for any nature lover. 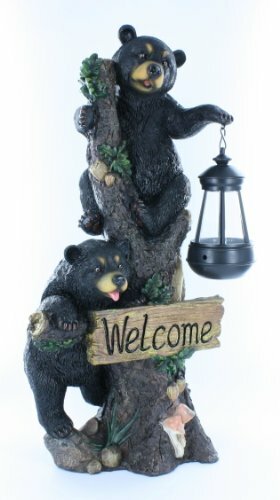 Highlight your entryway, garden gate or patio and extend your guests a warm 'Welcome' with this sculpted lantern featuring a trunk full of forest friends! This 18 inch high, 9.5 inch long, 6.5 inch wide (46 X 24 X 17 cm) cast resin statue boasts expertly sculpted details and a finely hand-painted finish topped with a decorative LED solar lantern! 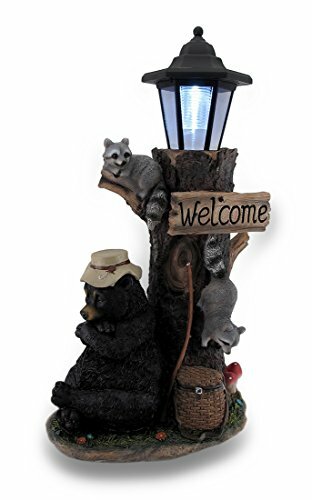 Amazing from any angle, this sculptural welcome lantern is great as a housewarming gift any wildlife enthusiast is sure to enjoy! 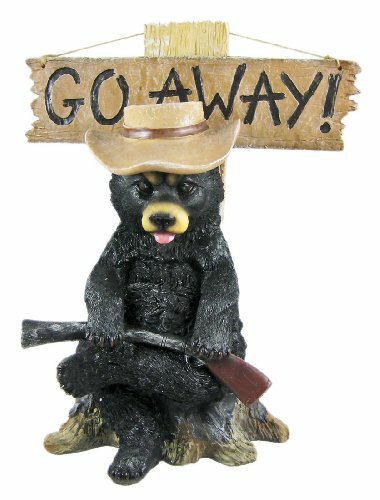 This grouchy country black bear lawn/garden statue, with floppy hat and shotgun, can help your neighbors, mailman, salesmen, etc. understand what kind of mood you`re in. On good days, turn the sign hanging from the post to read `Welcome`. On bad days, turn it around, an it reads `Go Away`. The figure measures 17 inches tall, 13 inches wide and 7 1/2 inches deep. Made of extremely durable bonded marble resin, this figure is fade and breakage resistant. 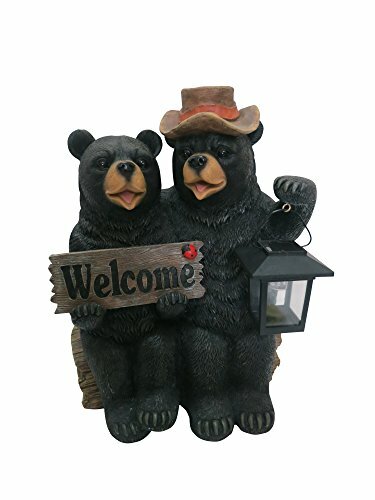 Solar Couple of Bears with Lantern and Welcome Sign. Made of Polyresin and Lime Stone. Long Lasting solar batteries. Durable paint. 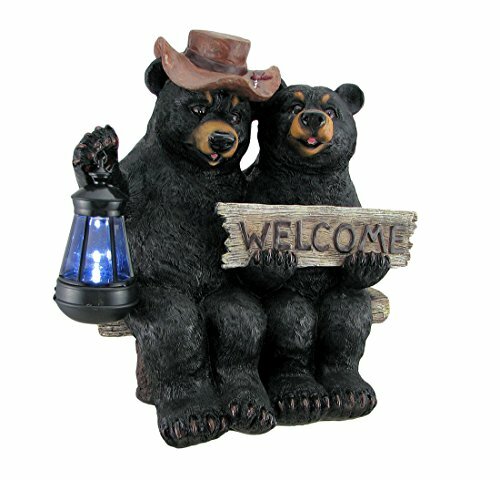 This wonderful black bear couple welcome statue is a great way to greet friends at your front door!. Made of cold cast resin, is hand-painted and shows amazing detail. It features a solar powered LED lamp to help light your guests' way. It measures 14 inches tall, 14 inches long and 9 inches deep. 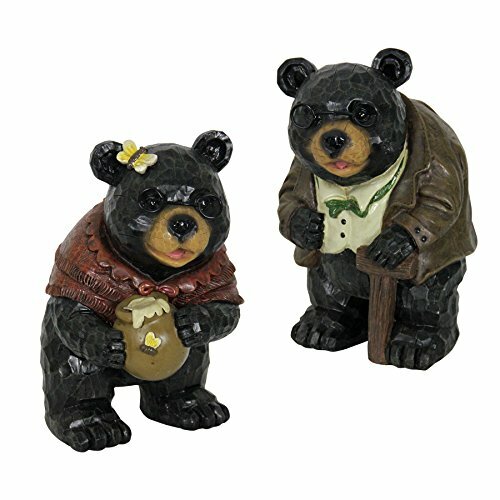 Exhart's Grandma and Grandpa Bear statues will bring a touch of whimsy to your décor. The statues are constructed from high quality resin, and will endure most weather conditions. Each statue is hand-painted and treated for UV resistance to prevent fading. These statues come as a set of 2. Two adorable cubs climb a tree to get to the sweet honey, but it's just 'bearly' out of reach! Give your guests a glowing welcome at your door, this is one deLIGHTful statue! It's hand painted and textured with fur and bark for a realistic appearance, and the 5 x 3 inch lantern sits right at the top of the old tree trunk, giving it a lamppost look. Enjoy this cast resin lantern in the garden, near the pond or pool, or on the back patio. It includes a rechargeable battery, simply flip the power switch to the ON position (after initial charge) to watch it glow night after night! It's a great addition to any rustic, lodge or outdoorsy inspired home or shop window!